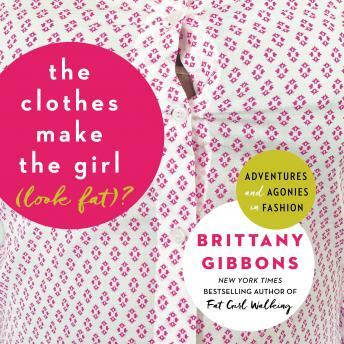 A sartorial follow-up to her hilarious memoir in stories, Fat Girl Walking, internet personality Brittany Gibbons once again deep dives into the world of the plus size woman, this time chronicling her love/hate (but mostly hate) relationship with what fashion. From Pinterest boards and Instagram posts to shop windows and ad campaigns, fashion is everywhere. We shop and dress for practical reasons like job interviews or to make a good impression at the board meeting. We shop and dress for more adventurous reasons—for dates, to woo a lover, to catch someone’s eye. Clothes are armor for women, and we wrap a lot of meaning in what we choose to wear. As plus-size spokesmodel and blogger Brittany Gibbons knows, what we choose to wear is especially important, and especially emotional, for curvy women. This isn’t only because curvy women feel underrepresented and underserved by the fashion world. For the curvy woman who struggles with feelings of self-worth and a lack of confidence the feeling of 'why bother' can come crashing in. You can’t help but think 'wouldn’t leggings and a slouchy sweater just be easier?' Especially when we, like every other woman on the planet, are facing greater, real-life obstacles like raising kids, attending college, keeping your marriage together, paying bills, and a myriad of other daily struggles. Everyone has those days where they hate their body, they hate their clothes, but self-confidence and strength can come from a great outfit. Brittany is determined to help women, curvy and otherwise, embrace fashion and all the bumps and lumps that come with it. An 'overdue love letter' to her body, Brittany delves into the hilarity and the humility of her quest to find her own personal style—to break out of a rut of maternity underwear and men’s undershirts once and for all. From wardrobe malfunctions, to fashion advice, to mom bodies and the perfect pose, The Clothes Make the Girl (Look Fat)? is the empowered battle cry all women deserve.